Vic Batista: As we enter Daniel 11, we are diving into a new chapter as we travel along this incredible Bible prophecy journey through the Book of Daniel. But, before reading this amazing revelation from God’s mighty angel, let us briefly recap Daniel 10. Nathan Jones: Chapter 10 finds the Prophet Daniel praying and fasting for three whole weeks! The reason? He is waiting for an answer from God. Low and behold, a messenger angel shows up. Daniel is naturally terrified. The angel actually has to strengthen Daniel so that he can receive the message God sent him to give to the aged prophet. That message had already been delayed because the angel, likely Gabriel, was waylaid battling the demonic Prince of Persia, who is likely a head demon in the hierarchy given control over the Persian Empire. The demon was holding God’s messenger angel back. The Archangel Michael soon arrived and joined Gabriel in fighting the Prince of Persia. Victorious, Gabriel travels onward in order to give Daniel God’s message. That insightful look into angelic warfare actually leads the reader into chapter 11. It’s a strange chapter break. One cannot help but wonder about the monks who decided verse and chapter breaks, because the rest of the sentence goes right into chapter 11. Daniel 11:1 finishes the sentence from Daniel 10:21. Vic Batista: What Daniel 10 has described has been a real peak into an epic spiritual battle, which Ephesians 6 reveals takes place in the heavens and all around us. Angelic warfare is not something that we see with our eyes, but the Bible says occurs ongoing. Nathan Jones: How fascinating that behind all of mankind’s battles being waged across the earth, spiritual warfare also is being waged between God’s forces and Satan’s forces. Daniel 10 stands out as one of the best chapters in the Bible for pulling the spiritual veil back so that we mere mortals can learn about the spiritual warfare going on in the background of mankind’s events. Back to the story, God sent His angel to answer Daniel as soon as Daniel had prayed his question, but the angel was delayed three weeks because of battling a demon. Imagine battling for three weeks! One angel pitted against one demon. The angel is not strong enough, so Michael the Archangel comes to Gabriel’s rescue. This fact demonstrates how powerful the demonic Prince of Persia actually was. But, the battle isn’t over. Gabriel must speedily relay God’s message to Daniel, and then right away head back into battle again to fight the Prince of Persia and soon the Prince of Greece. Vic Batista: This revelation also shows the relentless of God’s mighty angels. They may fight for God, but they also fight for God’s children as well. They finish up one battle, and when we pray to God for help, they move right on to the next battle. Nathan Jones: Praise the Lord that we are not standing on our own! God sends guardian angels to protect us. The Lord’s own strength empowers us. Just think about that for a moment. Christians, we are never standing on our own. There are times in our life where we feel that God has abandoned us, or that we cannot fight the suffering that we’re enduring, and the trials, and the attacks from our enemies. And yet, God provides His own strength and angels to protect us. God empowers us, and when we’re not strong enough, God directly intervenes by sending His angels to fight the demonic warfare being waged against us. Vic Batista: Christians rarely grasp how real the spiritual battle is between God and Satan. Most people don’t recognize that the battle also materializes in our own thought life. Through temptations the enemy creeps into our minds and then our hearts. That’s why Romans 12:1-2 calls for us to renew the spirit of our mind. A spiritual battle wages inside our heads and hearts. Nathan Jones: It’s so very important that we stay connected to God. Not doing so would be like a foot soldier walking out into the battlefield all by himself without any support from his platoon. We become just like that lone soldier roaming out into the middle of this spiritual battlefield. If we are not connected to the General for orders, leaning on the support of God’s mighty angels, as well as our brothers and sisters in Christ, then we become very vulnerable to attack. Without these supports, you will most assuredly be defeated by the Enemy. Vic Batista: Ephesians 6 orders the Christian solder to put on the full armor of God. Second Corinthians explains that our weapons used to fight in this warfare are not necessarily physical, but rather they spiritual, and mighty enough to pull down strongholds. Nathan Jones: The Christian’s weapons are certainly different than Man’s weapons. Vic Batista: Our spiritual weapons include fasting, prayer, praise, and worship. One of the situations the enemy hates is when we turn things around by beginning to praise God, recognizing that it is Him who strengthens us during these attacks. Nathan Jones: Our spiritual weapons are often times called spiritual disciplines. Engaging in these personal spiritual disciplines helps us to become better servants of the Lord. We become more in tune with the Lord. We connect stronger to God through prayer and Bible reading. Vic Batista: I love how we closed, but not closed, Daniel 10. Chapter 10 is indeed connected to chapter 11, but in truth, they are one continuous message. Nathan Jones: Daniel 11 stands out as one the most difficult prophetic chapters out of the whole Bible to understand because one really has to know the Intertestamental history in order to interpret its prophecies. Certainly, I am no expert on history. I have to go to the experts on history to provide the play-by-play of what the messenger angel is revealing about the future. 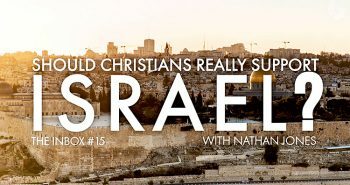 The angel gives Daniel a play-by-play of the battles that will happen to Israel as this nation is caught up in the middle of two warring Greek regions. The time period covers what’s called the Intertestamental Tme Period, or the 400 Silent Years, when God ceased talking to the Jewish people. These silent years stretched from the Prophet Malachi, who finishes up the Old Testament, and ends as the Gospel of Matthew begins. When we read Malachi in the Old Testament and then the first book of Matthew in the New Testament, we seldom realize that the gap covers 400 years of time. God dropped no message on the Jewish people for a whopping 400 years! Daniel 11 fills that four century gap. Gabriel explains that warfare will be waged by different Greek kings who will fight back and forth against each other, with Israel caught in the middle. But, near the end of chapter 11, the prophecy skips way ahead into the end times and starts prophesying about the Antichrist. Many people who have not grounded themselves in the Bible, and who do not look at the Bible as God’s inerrant Word, discount Daniel’s prophecies in chapter 11 because they are so accurately connected to history. Daniel 11 was fulfilled 100% historically! Therefore, the skeptics postulate that Daniel must have been written in 200 BC. He couldn’t have written these prophecies around 550 BC because his prophecies were just too accurately fulfilled, they believe. But, with God, prophecy is always accurate, because God always knows what is going to happen from the beginning of time until the end of time and beyond. Vic Batista: Prophecy often times jump, or move around different time intervals. Some events or characters prefill a future final fulfillment. There’s more to the plot with some prophecies. So, to open up Daniel 11, people really need to also open up their history books. A lot of what we learned in school in terms of history fits snugly into the biblical narrative. Nathan Jones: When teaching through Daniel 11 in the past, I have used two main history books. The first is A Survey of Israel’s History by Leon J. Wood. Another has actually been from an old tape series titled The Future of Israel by Dr. John MacArthur. On tape five he leads the listener verse-by-verse through each of the Daniel 11 prophecies, and then explains how each prophecy was fulfilled in history. I highly recommend these two companion resources for those who are reading through Daniel 11. To understand Daniel 11, one must engage with a dirty five-letter word called Study. To really appreciate Daniel 11, we have to study the corresponding history. It’s well worth it, because history was fulfilled exactly in order as the prophecies were given to Daniel. To me, when a prophecy is fulfilled so accurately and so distinctly, not something general but detailed and specific, that confirms to us that the Bible is truly God’s Word. Vic Batista: Study and seek the Lord in prayer, just as Daniel did, and allow the Holy Spirit to open up the Scriptures. Nathan Jones: How very important that the Holy Spirit guides us in our Bible reading. But, we need to at times, in order to understand history, to consult the biblical archaeologists and the historians. Another proof that the Bible is indeed the Word of God, besides fulfilled prophecy, is that no religious text has ever been penned that is so historically documented. Every day archaeologists kick over a stone in Israel and rediscover something that proves the Bible. All the prophecies in Daniel 11 that the prophet received actually happened in history, confirmed 100% by historians and archaeologists. In the forty-sixth segment of this series on the mighty angels of Daniel, the prophecy concerning the four-way division of the Greek Empire will be revealed! Previous PostThe Inbox: Should Christians Really Support Israel? A friend just emailed this to me. Wonderful study! Judy, thank you for those encouraging words! So good to hear our Daniel study has been a blessing to you.